Investigation: How Do Enzymes Work? This lab was modified from an AP lab so that it can be assigned to freshman. NGSS requires students to have a basic understanding of organic compounds, and the functioning of proteins can be particularly difficult for freshman to conceptualize. 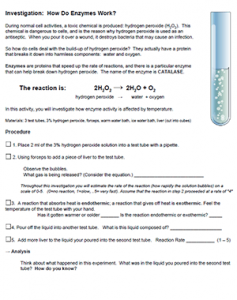 This lab is fairly basic, but when given with guided instruction how enzymes catalyze reactions, students can have a hands-on experience into how proteins are related to function. This version is shortened and gives much more specific instruction than the AP Lab: Enzymes which also includes an inquiry section. An extension of the AP lab (Concentration of Enzymes and Reaction Rates) looks specifically at how concentrations affect the rate of reaction by soaking filter paper circles in catalase. The filter paper will sink and then float as oxygen from the reaction is created, providing an indirect measure of reaction rate. Another modification that can be made to simplify the process is to use small petri dishes instead of test tubes. Liver can be cut ahead of time and placed in warm and cold water baths to reduce the number of steps and eliminate the glassware component in the lab. These can be washed and reused or just thrown away at the end of the activity. This Student worksheet has this alteration in the directions.